We all understand the importance of exfoliation in everyday beauty regime. It help us in removing the dead cells of the skin, in cleaning the skin of its impurities and lets the skin breathe. 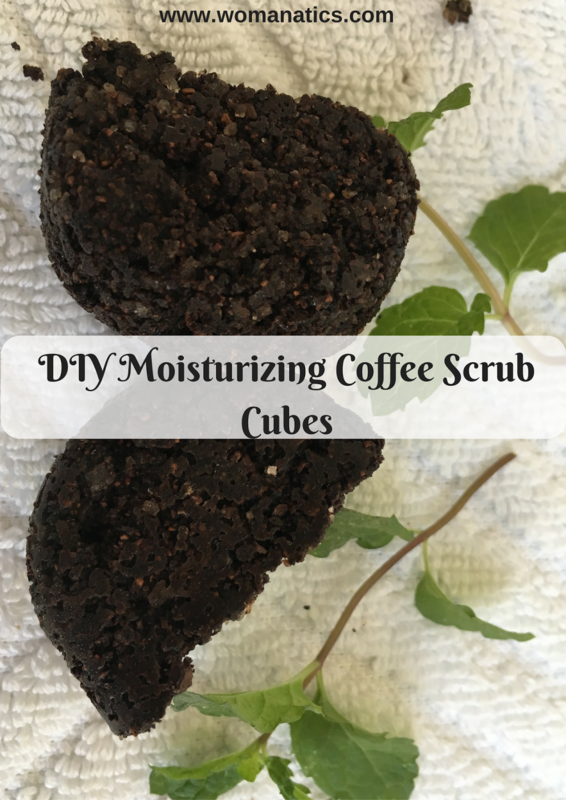 I have always been a fan of DIY and home made beauty products. I have been making my own beauty products for a long time and only recently I decided to share my knowledge with you all. I am not a beauty or health expert, but I have learnt few things about making beauty products at home. The best of which is that home made products give us the huge benefit of customization where we can add and remove ingredients as per our choice and skin type. 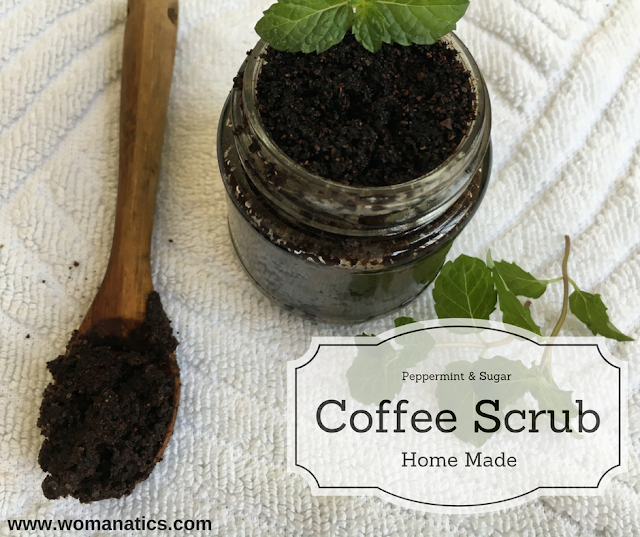 In this four ingredient DIY Moisturizing Peppermint Sugar Coffee Scrub, I have added the ingredients that I love using on my skin. To make the scrub cubes, I simply put the scrub in freezer for few hours and the cubes were ready and pretty! Coffee gives me the kick. Not only in the form of a hot cup every morning but also its aroma in any form rejuvenates me. Plus, coffee is said to be helpful in reducing stretch marks and in removing cellulite. Powdered coffee grounds make an excellent exfoliator which is why coffee was my first preference in this preparation. Sugar granules also work effectively in exfoliation. I added powdered sugar granules because coffee alone doesn’t give the necessary scrubbing effect. It gets a little gooey and I find it a little hard to rub it on skin. But when sugar granules are added, the two work wonderfully well. I powder my white sugar to get the desired coarseness. My third ingredients was of course an oil. I chose coconut oil because of its immense properties including its moisturizing use. You can add olive oil or almond oil or any other oil that you prefer. Finally, I added few drops of peppermint oil. Peppermint is cooling and soothing and helps in relaxing. Moreover, I enjoy the cooling tinge it gives. You can add any essential oil of your choice. 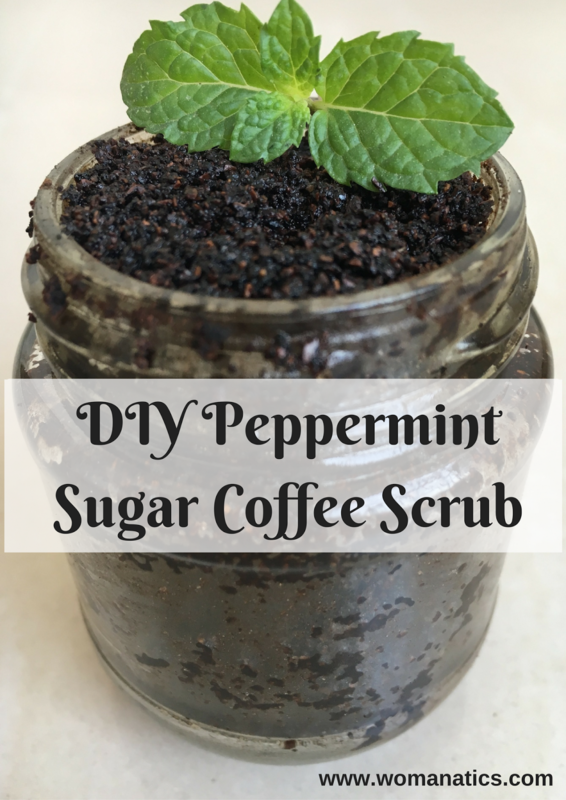 The scrub is extremely simple and easy to make. Mix all the dry ingredients together in a jar. Pour over the oil slowly to get the kind of consistency you desire. Add essential oil drops for overall aroma and added benefits. 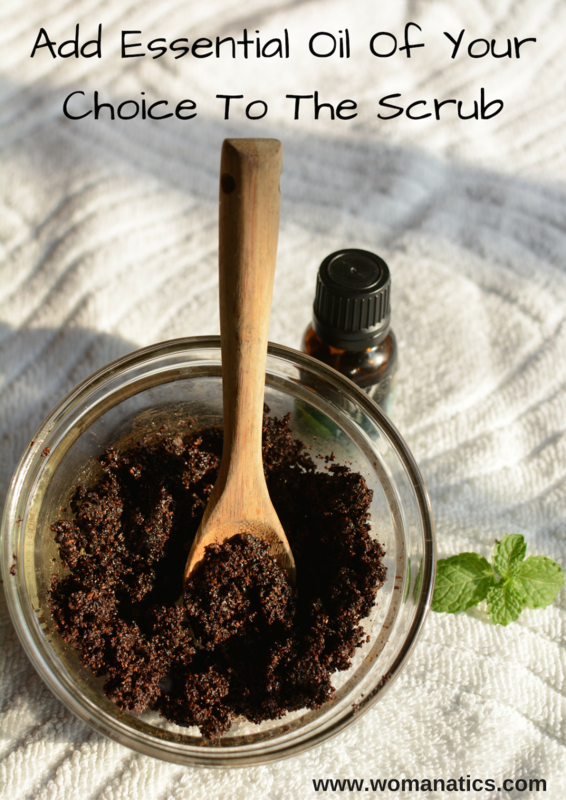 This scrub can stay on the shelf for up to 3 months, if you add a capsule of Vit. E to it. The best practice is to use it 3-4 times in a week although I use it as and when required. There are times when I use it regularly for days and times when I use it once or twice a week. 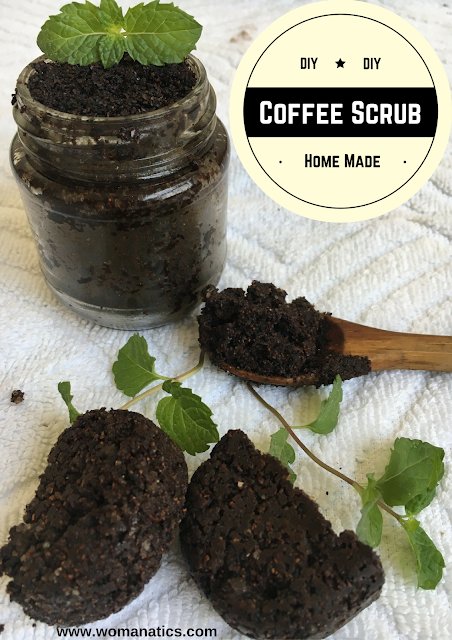 Overall, I am addicted to my home made sugar coffee scrub. I also froze a small amount of the scrub in ice-tray for few hours to make the scrub cubes. Scrub cubes come very handy in times of hurry. Remember to add coconut oil to the concoction as coconut oil only has the tendency to freeze. No other oil freezes so if you wish to make scrub cubes, add coconut oil and not any other oil. This isn’t the first time I have made it. I have been using it for the past two years. Each year I add a new variety of moisturizing oil and essential oil to try out different concoctions. For example, last year I added olive oil and few drops of rose oil. I use it on my body as well as on face. In fact, I wanted to use it on face which is why I didn’t add brown sugar as I find brown sugar a little harsh on my facial skin. Powdered white sugar granules work absolutely well on my face. Try this out and make your own batch. You will love it, I promise.